ST. GEORGE, UT - W. Harold Handley, 94, died Friday, March 8, 2002, in St. George, UT. He was born Nov. 20, 1907 in Salt Lake City, UT to George Alfred and May Ferrell Handley. He married Elaine Paxman Aug. 20, 1931 in the Salt Lake LDS Temple. She died April 5, 1992 preceding him in death. He married Marjory Forsgren Hart Dec 17, 1992 in the St. George LDS Temple and they were sealed April 1, 1993. His long career in education took him to positions, first in Oxford and then in Preston, ID; the head of the business department at the Weber College in Ogden, UT. He then went on to Salt Lake where he was the student counselor at Cyprus and Olympus High School and then the principal of the Olympus High School. Just prior to his retirement he was director of the secondary education of the Granite School District. He earned both his Masters and Doctorate Degrees of Education from Stanford University. He was respected and loved by his associates and students throughout his education career. He was an avid fisherman, liked golf, traveling and was always interested in learning. He served faithfully in his LDS Church callings. 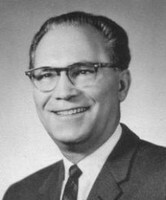 He was active in Scouting for many years in Idaho and Utah; on the MIA General Board and served as bishop of the Ogden 23rd Ward while in Ogden. He served in Salt Lake, as a high counselor and president of the Stake Sunday School in the Hillside Stake; bishop of the Mountain View 3rd Ward; served in the bishopric for the Salt Lake County Jail; Temple Square guide; Salt Lake Temple veil worker; guide at Pioneer Village at Lagoon; helped in what was formerly known as the Sr. Aaronic program where he was instrumental in reactivating many fine families. He was a dedicated home teacher. Was honored in the Salt Lake Tribune in 1992 for his service to the widows and neighbors in his area. In St. George, he was a home teacher, Ward Temple coordinator and president of the Gospel Doctrine Class. He is survived by his wife; daughter, LoRie (Doug) Thomsen; and son, Lawrence Harold (Jan); nieces and nephews; 26 grandchildren; and 26 great-grandchildren. He is preceded in death by parents; brothers, Kenneth, Vern, Irving, Floyd; and sister, Evelyn Adolphson. Services will be Wed. March 13, 2002, 12 noon, Bloomington 7th Ward LDS Chapel, 3371 Mulberry Dr. There will be a visitation Tues. March 12, 6-8 p.m., Metcalf Mortuary, 288 W. St. George Blvd, and one hour prior to services at the chapel. Services will also be Fri. March 15, 2002, 12 noon, Wasatch Lawn Mortuary, Salt Lake City, UT and a visitation 10:30-11:45 a.m. prior to services. Interment, Wasatch Lawn Cemetery. In lieu of flowers, donations may be made to Primary Children's Hospital, Salt Lake City, UT. The family wishes to thank the Red Cliffs Rehabilitation Center for their loving care of Harold.